Boo-hoo my content was stolen! Who cares. Recently, I was browsing Google Images to find some multimedia that would help visualize some talking points for the Social Media Management course I teach at Algonquin College. This is a completely regular, and useful, behaviour for me. 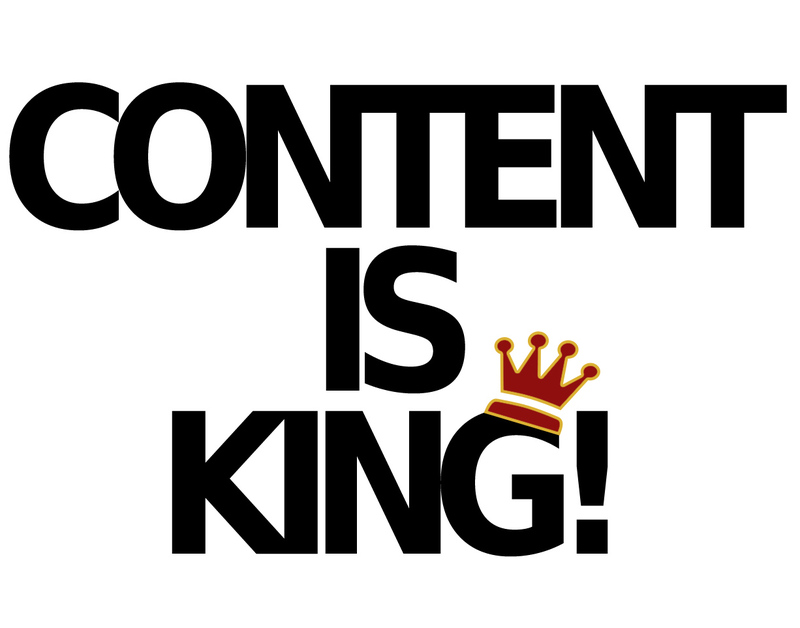 This time, I was just looking for the words “Content is King” stylized in some way to add a bit of visual interest. Pretty blazé, I must admit. After scrolling through a few pages of image search results, I came across the image to the right, and it struck me in just the right way – I loved it. I thought “this is exactly what I need” and proceeded to save it to my lecture folder and insert it into my presentation. Something was troubling me, though. I thought the image was awfully familiar, but just couldn’t put my finger on where I had seen it before. Then it hit me, I had created this image myself about three years ago for a blog post on davidhallsocialmedia.com about creating blog content. First of all, the saying itself has been bantered around for a good 20-25 years. Exact origin of the phrase is still a bit contentious, but most people will agree that Bill Gates popularized the saying in a mid-90s essay by the same name. I didn’t even put a twist on the saying, I used it verbatim, with no attribution. Second, the little crown I used on the “G” was not designed by me. That image is a stock shape in Adobe Photoshop. I simply tilted it on an angle and shaded it in using the colour palette from my blog. 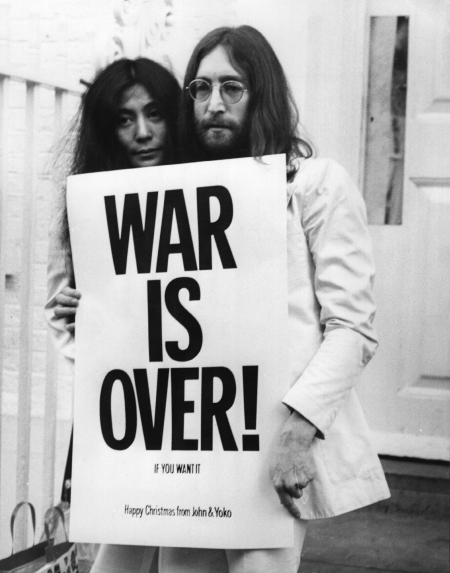 Finally, the typeface and layout I used were inspired by (or stolen) from the “War is Over” campaign by John Lennon and Yoko Ono. I’m a big music fan and thought it would be cool to pay homage to their work by visually referencing their peace advocacy of the late 60s and early 70s. Using a thick, black, sans serif font, stacking one word on top of the next, and including an exclamation point, I think the reference comes through. I even remember Googling to find the exact name of the font used. I imagine that some people would say that I stole all of these elements to make one giant copyright-infringing graphic. They would probably be right. On the other-hand, I would wager that there would be another cohort of people that would say that, although I was influenced by these existing works, I am ultimately the author of the image and should be regarded as such. They would probably be right, too. So after “stealing” content myself, and having my own content “stolen,” I’ve come to a few personal realizations about the whole stolen vs inspired debate. 1. It happens to (almost) everyone. Rest assured that if you publish content online, it will probably be “stolen” at some point. I am in no way special when it comes having content “stolen”. I chalk it up to the cost of publishing content on the web. In fact, the more people who steal “my” content, the more people will see it, right? 2. You probably stole the idea from somebody else in the first place. I really don’t consider sharing other people’s content, or creating mash-ups, stealing. If you look hard enough at any of your ideas, I’m sure most could be traced back to somebody else’s idea that you just modified, or flat-out stole (knowingly or not). What I’m getting at here is that very few ideas are actually so fresh they can be considered novel, so what right do we have to claim ownership over them? Consider your take on the idea as adding a new voice to the continual conversation, not a new flag in some sort of uncharted, intellectual territory. This quotation has been used, and reused, for over 100 years. It has been attributed to Pablo Picasso, T. S. Eliot, William Faulkner, Steve Jobs, and more. At the heart if it, it speaks to the role of the creator as the steward of content rather than the owner of it. As artists and creators, it is our job to take what has come before us, modify, re-contextualize, and republish it reflecting our lived experience. Content isn’t about ownership, it’s about continuing the conversation. I had a great boss for a number of years who used to tell me, “Dave, don’t bother reinventing the wheel, just put new hubcaps on it.”…an expression that I’ve added to my vocabulary (yes, I stole this too). 4. If you want to get paid for your content, and you think your profits are being lost to thieves, you need a business manager. I imagine that one response to this post might be “I’m trying to make a living on my content, so I have to be vigilant”. Don’t get me wrong, I’m all for making money. If your content is good enough to generate a profit, I applaud you (mine certainly isn’t that good). The problem is that creating content and making money are two very different things. Every good content creator needs a great business manager, and very few people are adept at both. Prime example, just Google Roy O. Disney. He was the business brain, Walt was the creator. Disney wouldn’t be what it is today without Roy’s business acumen. If your content is worth stealing, then you are on the right track. If you make it even better, someone might want to pay you for it some day. At the very least, you can consider having your content stolen as an indicator of value; you just need to find your Roy Disney to transform that value into dollars. What do you think about “stolen” content? Has it happened to you? Remember, if you like this post, go ahead, steal away.